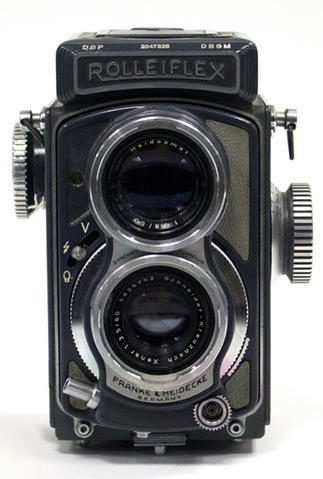 Item is a knob-advance twin lens reflex camera for 4 x 4 cm exposures on 127 format film. More compact than other twin lens reflex cameras, with a smaller negatives, the Grey Body has a Xenar f3.5 lens with a Syncrho compur shutter. The camera comes in a gray leather case and is equipped with an ultra violet Waltz filter and a lens hood. This cmaera is for demonstration, it is not a fully functinoal camera, but open to show shutter and iris action.